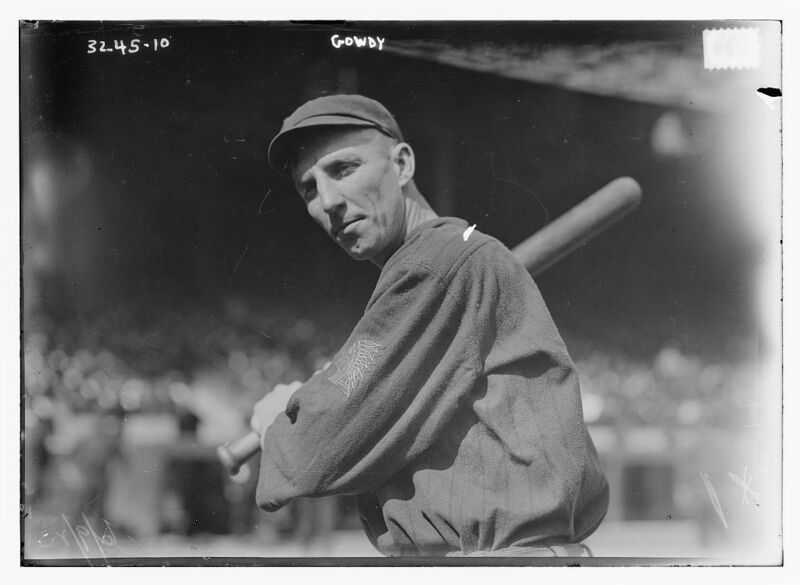 Best known today as the first active major leaguer to enlist for service in World War I, Hank Gowdy was a "fair-haired skyscraper" (he stood 6'2" and weighed 180 pounds) who caught more than 100 games in only three of his 17 seasons in the majors.1 Gowdy had what we would now call a Zelig-like ability to turn up as a prime actor in some of baseball's most dramatic scenes. He was key to the Boston Braves' amazing 1914 season, starring in their famous World Series victory, but a decade later he was blamed for the loss of another legendary Series. (His misplay is a primary reason why coaches now teach young catchers to hold onto their masks until they know exactly where the ball is, then to toss them well out of the way.) After retiring from baseball, Gowdy returned to the army once again and served his country during World War II. The son of Horace C. and Carrie (Burhart) Gowdy, Harry Morgan Gowdy was born on August 24, 1889, in Columbus, Ohio. As a youngster Hank sold peanuts at Columbus's Neil Park and played football, basketball, and baseball at Hubbard Elementary School and North High School. After trying out with the Columbus Senators, he began his professional career in 1908 as a first baseman with Lancaster of the Ohio State League, remaining there for two seasons. In 1910 Gowdy enjoyed a breakout year with Dallas, leading the Texas League in doubles (44) and home runs (11) while batting .312 and stealing 29 bases. John McGraw signed him for the New York Giants and gave him a seven-game tryout that September. With 21-year-old Fred Merkle firmly entrenched as the Giants first baseman, McGraw advised Gowdy to take up catching if he hoped to remain in the major leagues. The following year Gowdy had appeared in only four games when the Giants traded him and Al Bridwell to Boston for Buck Herzog on July 22. Thereafter he became the Doves' semi-regular first baseman, batting .287 in 29 games as a fill-in for player-manager Fred Tenney. Following McGraw's advice, Gowdy made the switch to catcher in 1912 but spent most of the season on the Boston bench, appearing in only 22 games behind the plate as a third-stringer behind new player-manager Johnny Kling and Bill Rariden. To that point he had never played an entire season at catcher, so in 1913 yet another new Braves manager, George Stallings, sent him to Buffalo of the International League to hone his skills. Gowdy batted .317 in 104 games, earning a late-season call-up to Boston. In 1914 the gawky 24-year-old became Boston's regular catcher, appearing in a career-high 128 games, 105 of them at catcher. Later Stallings himself stated flatly that his mild-mannered backstop was his most valuable player during that season's miracle run. A lifetime .270 hitter who batted just .243 in 1914, Gowdy claimed that he should have hit .300 that year: "I hit just as hard during the season as I did during the Series, except that during the season they were going right at somebody while in the Series they were going safe. "2 In Game One of the World Series he was 3-for-3 with a single, a double, and a triple, and he and first-baseman Butch Schmidt, the two slowest men on the team, executed a successful double steal. In Game Three at Fenway Park, which the Braves had borrowed from the Red Sox for the Series, Boston was down by two runs when Gowdy led off the tenth inning with a blast into the center-field bleachers. It was the only home run of the Series, and it ignited a rally that tied the score. In the 12th Gowdy got his third hit and second double of the game, a bullet to left field. Running for him, Les Mann scored the winning run on a wild throw. In the Game Four finale Gowdy went 3-for-4, giving him a .545 average for the Series. Over the next couple years Hank Gowdy remained a Boston mainstay behind the plate, catching an average of 115 games per season. In 1917 he took the step that, despite his 1914 heroics, assured his lasting fame. The United States entered World War I in April, and on June 1 Gowdy became the first active major leaguer to enlist, joining the Ohio National Guard. (Eddie Grant had enlisted in April, but he had retired as a player.) The big catcher reported for duty six weeks later and was overseas by early 1918. Gowdy served with distinction in the famed Rainbow Division, so-named by General Pershing because it had the uncanny luck of being surrounded by rainbows during the heavy combat it faced. Arriving in the Lorraine region of France in March, Gowdy endured trench warfare in its most brutal sense as the Germans made their fierce last effort to overrun the Allies on the Western Front. He carried the colors for the Fighting 42nd and returned to the United States a genuine hero, as popular in Boston as the mayor himself. Turning down an offer of $1,500 a week for 30 weeks to tour the country and speak of his heroics, Gowdy returned to the Braves and on May 24, 1919, hit the first big-league pitch he'd seen for almost two years for a single. He went on to catch 74 games and bat .279, a 65-point improvement on his last pre-war season. In 1920 Gowdy was behind the plate for duration of the 26-inning classic in which Boston's Joe Oeschger and Brooklyn's Leon Cadore locked up for a 1-1 tie. In the 17th inning he played a key role — actually two key roles — in what one reporter called "the most remarkable double play ever seen in Boston. "3 With the bases loaded and one out, Brooklyn catcher Rowdy Elliot tapped back to Oeschger, who fired to Gowdy to force Zack Wheat at the plate. But Gowdy's throw to first base was low and Walter Holke bobbled it. Big Ed Konetchy, running from second, tried to score on the fumble. Holke's return throw was off to Gowdy's right. He reached for it, grabbed it, then "threw himself blindly across the plate to meet Konetchy's spikes with bare fist," a vivid snapshot of the Deadball game.4 That season Gowdy batted just .243, but in each of the next two post-Deadball Era seasons he established new career highs by hitting .299 and .317. In June 1923, with Stallings long gone, the Braves once again mired in mediocrity, and Gowdy off to a miserable .125 start, McGraw brought the veteran catcher back to the Giants in a four-player deal. Though he never played more than part-time, Hank posted the best offensive statistics of his career in his two-year stint in New York, batting consistently in the .320s and establishing a career high with four home runs in 1924. He also played in two more World Series. In the 12th inning of Game Seven of the 1924 fall classic at Griffith Stadium, Gowdy literally stepped into the spotlight again — this time as a goat. With one out and no one on, Washington's Muddy Ruel popped up what looked like an easy foul. Gowdy tore off his mask, tossed it to the ground, and promptly stepped in it. "I thought my foot was being held in a bear trap," Gowdy later recalled.5 He staggered around and couldn't reach the ball, which dropped to the ground. Given new life, Ruel doubled and later became Washington's winning run when Earl McNeely hit a hopper over Freddy Lindstrom's shoulder at third. Sportswriters, calculating the winning team's share, called Gowdy's misfortune "a $50,000 muff." Partway through the 1925 season the Giants released Gowdy even though he was batting .325. He spent the next three seasons in the high minor leagues before returning to Boston as a coach in 1929-30. Gowdy celebrated his 40th birthday in 1929 but still managed to hit .438 in 16 at-bats for the Braves that season. He went on to coach for the Giants and the Cincinnati Reds during the 1930s, then joined the army as a major in World War II, becoming the chief athletic officer at Fort Benning, Georgia, where the baseball diamond is now called Hank Gowdy Field. Gowdy died at age 76 on August 1, 1966, in his hometown of Columbus. Though married for many years, he and his wife left no children. An earlier version of this biography originally appeared in "Deadball Stars of the National League" (Potomac Books, 2004), edited by Tom Simon. It is also included in "The Miracle Braves of 1914: Boston's Original Worst-to-First World Series Champions" (SABR, 2014), edited by Bill Nowlin. 1 The “fair-haired skyscraper” description comes from Harold Kaese, The Boston Braves, 1871-1953 (Boston: Northeastern University Press, 2004), 150. 2 Charles Einstein, The New Baseball Reader (New York: Penguin, 1992), 261. 3 Andrew Paul Mele, ed., A Brooklyn Dodgers Reader (Jefferson NC: McFarland, 2005), 30. The article “Brooklyn v. Boston in 26 Innings” is written by Ralph D. Blanpied. 5 Harold Kaese, “Gowdy Class in Tough Era,” Boston Globe, August 7, 1966.